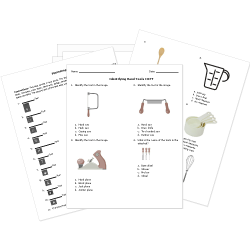 Our free printable worksheets offer a wide-range of content covering the four basic subjects (English/Language Arts, Math, Science, Social Studies) and a large variety of other subjects, including Early Education, Art, Music, and Study Skills. Our free content is organized by grade-level and spans grades pre-K through 12. Use our free printable worksheets in conjunction with our Test Room feature to give online assessments or print them out to use as part of classroom activities or short quizzes. Build reading and writing skills with our growing collection of free ELA worksheets covering grammar, vocabulary, spelling, literature, and reading strategies. Many of our free grammar, and spelling worksheets help build beginning reading skills, while our reading strategies and vocabulary worksheets help improve reading ability and encourage higher order thinking skills. Assess student understanding of arithmetic, algebra, and geometry concepts with these math worksheets for K-12 students. Worksheets encourage students to think critically and build logic skills as they improve their mathematical reasoning and logic skills. Challenge students to explore the natural and physical world with this collection of science worksheets and activities. Worksheets promote the scientific method and improve problem-solving skills while reinforcing the scientific knowledge kids need to learn in grades K-12. 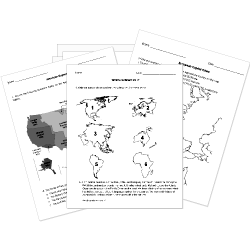 Develop critical thinking skills and understanding of U.S. and world history and geography with these social studies tests, interactive activities, and review worksheets. Worksheets cover key periods and events in history, as well as reinforce key vocabulary words and promote skills such as reading maps and timelines. Help kids build their basic skills with our collection of early education worksheets. Our printables and coloring pages cover basic number and shape recognition, as well as help kids learn the letters of the alphabet. 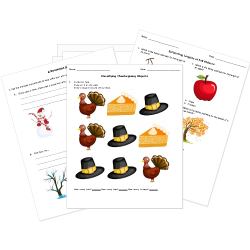 You'll also find printables that help them learn their colors, and even activities to build their thinking skills. This large variety of quizzes, tests, and worksheets cover dance, theatre, music, visual arts, and more. Use these free worksheets to help student learn more about artistic masters and concepts before setting them free to create and perform on their own. Promote effective learning strategies with our growing collection of checklists, self-quizzes, templates, and study skills worksheets. Our worksheets are designed to help students get organized, learn to manage their time and help improve their test-taking skills. Enhance student learning across curriculum areas with these printable graphic organizers. Choose from over a dozen popular styles of graphic organizers that help encourage critical thinking and encourage students to pay attention to details as they record, organize, analyze, and synthesize information. Use these worksheets covering fitness, nutrition, sports, for a review or assessment. Our free printables help students learn the basic rules and history of popular sports and cover tips for living an active and healthy life. Use these worksheets to help high school students learn basic life skills - money management, banking, understanding debt, driving safety, and many more.